Like most middle-class Americans in 2006, we eat out at restaurants mainly for an occasional hour of low-cost,convenient fun in our neighborhood. And it's usually at a local coffee shop, the corner Chinese eatery or a chain restaurant....Marie Callendars, Chilis or Mimi's here in Southern California. Last night, for the first time in too long, Ron and I celebrated our anniversary at an intimate, quietly elegant cafe, The Wild Artichoke, a few miles from our normal daily sphere. 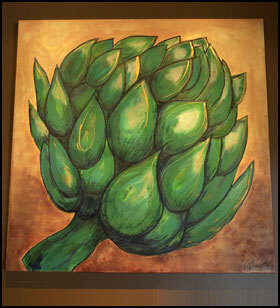 The Wild Artichoke has only eleven tables, and the sole chef, James D'Aquila, is also the owner. He cooks purely for passion, but has arrived at enough profitability to quit his former day job. His beloved cafe is open for dinner from 5 to 9 PM Tuesday through Saturday, enough for two seatings each of the five days. When patrons are dining, and he's reached a lull in his cooking, forty-something Mr. D'Aquila unobtrusively wanders from table to table, warmly greeting guests and chatting ambiably about the food. And oh...the cuisine. Here's a link to the dinner menu. Jame's creations are otherworldly in delicate, unique goodness. Ron and I shared the The Wild Artichoke Napoleon appetizer. He had a cup of roasted artichoke soup, and I had special fried calamari salad with fresh basil, thinly julienned red onions, and a sprinkling of sliced jalapenos, all marinated in balsamic vinegar and soy sauce. For our entrees, I enjoyed an off-the-menu seafood pasta with scallops and shrimps in a lobster sauce, and Ron savored Jack’s Creole Shrimp and Hot Sausage Pasta-Jambalaya, with sautéed garlic, diced tomatoes, diced applewood smoked bacon, roasted red bell peppers, shallots, okra, fresh herbs and spice, simmered in a white wine cream sauce. We love fine cooking and dining, and relish spending time with others who also enjoy the same pleasures. Our two-plus hours at The Wild Artichoke were a delightful way to celebrate sixteen years of marriage. I recommend The Wild Artichoke for sophisticated yet comfortable dining. Leave the kids home or drop them off for pizza. They'll be happier, and so will you.